Generally speaking, most men these days tend to sport closely cropped haircuts. If you happen to be one of the men that enjoys having a neatly trimmed, easy to maintain ‘do you can thank an unpopular English tax and a bet made by a duke for saving you countless minutes every morning. While the likes of Queen Elizabeth I and Mary I of Scotland had previously helped popularise wig wearing among women around this period, if you’ve ever seen a period drama, an episode of Blackadder or just happen to be a fan of the absolutely dreamy Governor Weatherby Swann from the Pirates of the Caribbean franchise, you’re likely aware that men used to sport flowing wigs of the powdered variety. This particular fashion trend has its seeds in a disease that particularly reared its patchy head during the 16th century. At this time (and beyond), Europe was suffering from a major syphilis epidemic, possibly a disease brought back from the New World, with one potential side effect being that some sufferers experienced patchy hair loss. Wearing a wig, while not considered as good as the real thing at this point, was generally thought to be a superior alternative to going out in public in this sort of balding state. Rather than a bout with syphilis, King Louis XIII is thought to have simply been the genetic recipient of male pattern baldness (see: What Causes Baldness). 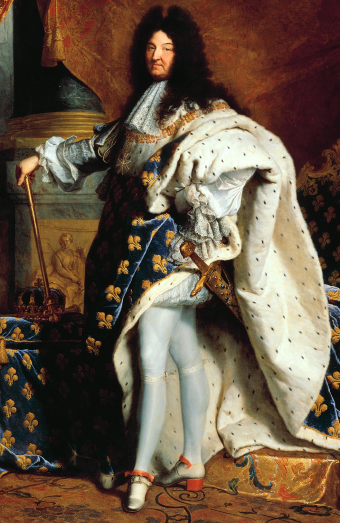 Being king and all, rather than being mocked for wearing a wig to cover this up, he was mimicked and wigs not only became fashionably acceptable, they slowly became the social norm, even if you already had a glorious set of locks. A potential side benefit that may have helped the popularity of the wig along was also the fact that lice, a bit of a problem for some in this era and region, became less of an issue with wigs; by shaving off your own hair and wearing a wig that could be more thoroughly sanitized separate from your head, this meant getting rid of lice was a little easier. A similar thought process saw women, particularly prostitutes, of the 15th and 16th centuries in Western Europe shaving their nether regions and then wearing wigs, known as a merkin, where the hair used to be. This allowed them to still keep some semblance of modesty, avoid the lice problem, and potentially hide signs of any STDs. 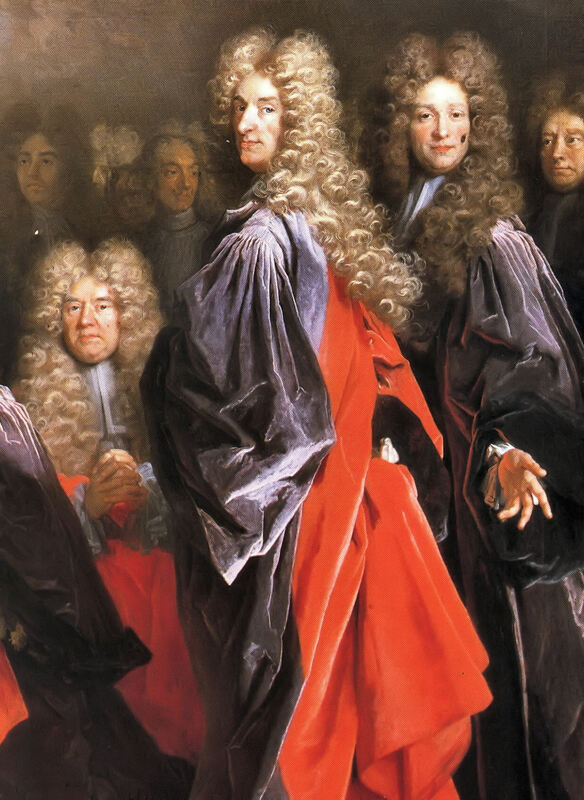 Over the years, men’s wigs became more restrained in nature, moving from the large, bouffant-esque headpieces typified by people like Charles II to more restrained powdered ponytails seen atop the head of everyone from the founding fathers to the prime-minister of England. 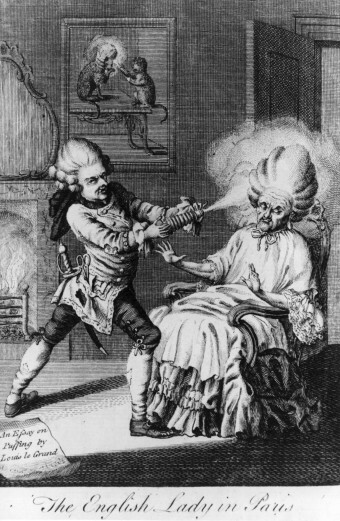 The use of hair powder (in England anyway) was so ubiquitous that in 1795, then Prime-Minister William Pitt the Younger ushered in a tax on the product in an attempt to raise money for the country which, as was often the case back then, was warring with France. The tax required any man wishing to purchase hair powder to pay a guinea (equal to about 70 pounds or 100 dollars today) for a certificate that would grant them the right to buy hair powder for a year. As so often happens when new taxes are introduced, people weren’t happy about it. One person in particular who was annoyed by the tax was the then Duke of Bedford, Francis Russell, who refused to pay it on principle. In protest, the Duke had his hair cut short and scandalously wore it unpowdered and unstyled in court. The Duke, knowing just how unpopular the tax was, also encouraged his friends to adopt a similar, natural hairstyle in political protest, which they all did, agreeing to, as reported in the London Chronicle “forfeit a sum of money if any of them wore their hair tied or powdered within a certain period”. The hair style was dubbed the “Bedford level” by the Duke’s peers as a nod to a large area of marshy land in the Fens his family had drained (or levelled) recently, known, funny enough, as the “Bedford Level”. The name was also a playful allusion to the Duke’s somewhat controversial and reformist political views. The style quickly became popular throughout the Duke’s not unimpressive circle of influence and even became something of a symbol of protesting the new taxes, even among the common man. As a result of all this, the style slowly disseminated throughout the country. Over time, and as short, closely cropped hair became the norm, men began to experiment with differing styles, mostly modelled after classical images from Greek and Roman art. In particular, men took inspiration from the two Roman emperors- Caesar and Titus- as well as Brutus, all of whom are classically portrayed as sporting shorter hairstyles of varying styles. By the time the government stopped the powder tax in 1869, powdered wigs were almost unheard of with less than a thousand people still paying the tax when it was finally repealed. At this point, the shorter, more economical style introduced by Bedford was firmly ingrained in modern English men, something that hasn’t really changed too much in the time since.